Property Size 950 sq. ft. Welcome to Moonlight Beach! This home is located within a few steps to the Beach. Clean, Bright, and Relaxing from the moment you pull into the driveway. With ocean/ white water views from the home in almost every room, you will be able to hear the ocean waves and feel the ocean breeze during your stay. This home has 2 bedrooms, separated by the living room and kitchen areas. The living room has a large sectional, ottoman, and TV perfect for movie nights or watching the big game. The kitchen is fully stocked with Pots/Pans, dishware and necessities to prepare meals at home. Two large sliding glass doors lead to the fantastic patio with a fire pit, lounging chairs, dining table, and a hot tub. (hot tub only may be shared with long term resident upstairs). The first bedroom has a queen bed, TV and vaulted ceilings with a tiered/ tray ceiling. The second bedroom has a queen bed with a work space area and desk. 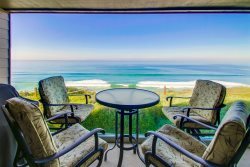 This condo is perfectly located next to shopping districts, cafes, restaurants, and everything you could desire in Encinitas within walking distance. Moonlight beach features Bathrooms/changing stalls, showers, and many lifeguards. There is also a concession stand, volleyball courts, fire pits, and a playground for kids. Washer and Dryer located in home, Wifi, Cable, Tv's, Childrens beach toys, Boogie boards, & Towels provided, This home is perfect for a relaxing get away at the beach! Standard Amenities: Wifi, Outdoor Deck with Dining table, Patio, Shared Hot Tub, Beach access, Satellite / Cable, Television, Clothes Dryer, Internet, Iron & Board, Linens Provided, Living Room, Parking, Towels Provided, Washing Machine, Coffee Maker, Dishes & Utensils, Kitchen, Microwave, Oven, Refrigerator, Stove, Toaster, Full Kitchen, Refrigerator, Microwave, Toaster, Cookware,Linens, Washer & Dryer.